If you need to send fresh flowers to Durban in KwaZulu-Natal, inMotion Flowers (formerly Flowers for Africa) is definitely your best choice. As a Durban florist, we make up and deliver all our flower arrangements ourselves. This gives us direct control over the quality of flowers and the reliability of our service. We are committed to providing you with the best quality, so our florist goes to the market to hand pick our flowers on a daily basis, which ensures that you always get the freshest flowers available. Plus all our products are backed by our 100% satisfaction guarantee! In addition, we are usually able to accommodate specific delivery times more easily in Durban, and we will go out of our way to accommodate your special requests. If the flowers you are looking for are available in Durban, we will happily get them for you. To browse our entire flower collection, click on the Buy Flowers banner above. If you are looking for something more specific, select bouquets, flower arrangements, flower baskets, flowers for a new baby, funeral or plants from the Flowers dropdown menu above. If you can’t find what you are looking for, consider creating your own floral gift using our unique custom flower app. We are usually able to offer delivery of flowers on Sundays. See Sunday Delivery Restrictions at the end of this page. The date will be blocked in the calendar when you checkout, so if you’d like your order delivered on a Sunday, please choose Saturday or Monday, and then indicate in the special instructions field that you’d prefer delivery on Sunday. Note: Flower availability might be limited, as the market is closed on a Sunday in Durban. If it’s something decadent or longer lasting you are after, consider sending one of our food hampers or gifts to Durban. Click on the banner above to browse our entire gifts collection, or choose a category from the Gifts & Hampers menu above. If you can’t find the perfect hamper in our catalogue, you can create your own custom hamper. We have flowers, hampers and gifts for all occasions, be it for a Birthday, Baby, Thank You, Get Well Soon, Sympathy, or a special flower day like Valentine’s Day or Mother’s Day. We even have lovely Christmas Hampers and Gifts for the festive season, and a little something for Dad on Fathers Day. Alternatively, take a look at our featured products and bestsellers below. We also specialize in wedding flowers and bridal bouquets, so if you are planning a wedding in the Durban area, be sure to take a look at our wedding flowers section, and send us an enquiry. We’d be delighted to work with you on creating your perfect wedding. 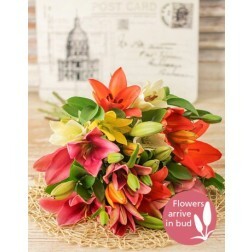 We offer same day delivery for flower orders placed before 12:00pm in Durban and most towns and cities in South Africa. Orders placed after 12:00pm will automatically be for next day delivery. While we cannot guarantee specific delivery times, we will always do our best to accommodate your requests. Our gifts and hampers are available for next day delivery in Durban, KZN and throughout South Africa if your order is placed before 12:00pm. We do however have a small selection of our most popular gifts and hampers that are available for same day delivery in Durban. Click to browse our collection of same day gifts and hampers to Durban. Specific delivery times are not available for gifts and hampers, since they need to be couriered. If you require a morning delivery, consider ordering flowers or a custom hamper. We have an extensive network of reliable local florists in KZN and throughout South Africa; however in Durban we make and deliver our flowers and custom hampers ourselves.